Duggar Family Blog: Duggar Updates | Duggar Pictures | Jim Bob and Michelle | Counting On | 19 Kids: Fussy Baby? No Problem! It's about time for another giveaway, don't you think? On our Bates blog, we are raffling off a unique product from KidCo called the SwingPod Travel Swing. All you have to do to enter to win is "swing" by the blog and follow the simple instructions. That thing will cause some kind of injury. It is too open to human errors. I had a mechanical swing and set on low it gently rocked the baby. The baby loved that and I could get a few things done while nearby. When are you guys going to add a photo of baby Garrett to the photos for the blog at the top? Gee, what did countless generations of moms do before they invented all this hi-tech stuff? Oh that's right, they held a fussy baby in their arms and walked the floor with it. that thing does not look safe. Looks like you could accidentally drop that, hit the baby's head on something, or hurt your shoulder. Things to consider before you use this swing. I think I'll stick to the usual way of calming grandbabies, holding them. Sorry, but this does not look safe. 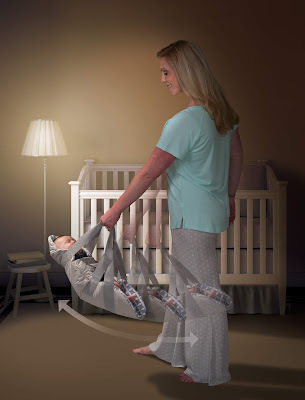 Once you get the fussy baby calmed down in this, how do you get them out of it again and not wake them up or startle them to start the fussiness all over again? Also, sometimes fussiness is from stomach gas, which requires an upright position to remove. This makes me chuckle. There's no end to the reinvention of the wheel, with hopes of making a buck in the process. I've found my old rocking chair to be the ticket for calming a fussy baby. I have 4 kiddos and 1 is 2 months. All I can say about that product is no way would I have ever put any of my babies in that. How does that folded webbing strap not hurt your hand when you add the weight of a baby to it? Ever try to carry a suitcase or duffel bag with a strap like that? I agree with most of the folks here. That looks scary. Since you have to hold the swing anyway and manually swing them, why not just cuddle the baby and rock him or her? Nothing made for baby can replace the comfort of a loving touch. If you would like to get things done, put the baby in a safety tested swing. If you have to swing it yourself then it would be much easier to just cuddle your baby in your arms and gently rock the child. I am sure the author of this blog is a lovely person, but do have to say that not only does this swing look unsafe, but also just plain tiring. No parenting newbie here either, I have 6 sweetie babies. I think it's funny how on the Bates blog the comments are all about how people want to win the raffle, and here the comments are all about the negative things people see in the picture. I would not trust myself to have the strength, mental or physical, to swing this around at 2am with a fussy baby in it. I'd be half asleep and ready for someone to swing me before I fussed, too. But the model in her PJ's in the picture looks pretty happy to have been awakened, and ready to give her left arm a mid-night workout... Who comes up with this stuff? Well, if you don't want the swing, then don't sign up for the giveaway. Some of the comments on the Bates blog are also rather skeptical of the concept. Stop this give away please. This is not safe and could couse shaken baby syndrome. As with anything, I think you just have to be careful. There are plenty of great baby products out there that require a good dose of common sense on the part of the person using them. For example, you wouldn't put your infant in a stroller and push it off down a hill, but you technically could. Even things like changing tables and cribs can cause death if used wrongly. I am a very cautious person, but I see nothing wrong with this product, provided that the user uses common sense. Have you ever put your baby in a swing? It's the same motion. Just rock your arm gently, and you'll be fine. Yes 12:47, but just look at that thing. It looks unsafe at any speed. At least strollers and baby swings come with safety features like straps and anti-tip designs. I see nothing on this one to keep a baby from sliding out, being dropped, being swung too hard, or being swung into another object. You have to remember that there was a time when well-meaning parents used all the common sense they had and babies were still getting hurt or killed in cribs, walkers, swings, and strollers. That's why the Consumer Product Safety Commission was formed (in 1972), and why they are constantly putting out warnings and recalls. Have you ever seen their page? It's full of baby product alerts. Looks like they came out this month with new federal safety guidelines for changing tables and booster seats, too. 1:44, I see what you're saying, but items that are recalled are usually either things with motors/parts that move on their own (swings, etc), stationary items that you leave your baby in unattended and could pose a safety risk (cribs, etc), or items with unsafe materials (flammable, etc). Something like this travel swing can't be unsafe unless the operator is being unsafe (or unless there is something wrong with the material or construction of it, which is possible with any item). I understand where you're coming from, but do you see what I'm saying, too? It's kind of like saying that a highchair is unsafe because it can be pushed over (all of them can be). Or that baby carriers are unsafe because if you don't fasten the straps properly, the baby can fall out (a potential issue with all carriers). Now I'm not saying that I would trust others to use the travel swing with my baby in it. But I would trust my husband and myself to use it safely. As long as you rock it VERY gently and don't misuse it (putting baby in it and carrying it around the house would be an obvious misuse, as would allowing older children to swing their baby sister or brother in it), there shouldn't be any issues. That being said, I haven’t seen the product, so I can’t speak to how well it is made, but I have seen many good reviews online, so I would certainly order it and give it a try IF it passes my mommy inspection. (Even if you order a “tried and true” item from a large baby-wise company like Graco, I would ALWAYS encourage you to do your own inspection on the product before using it.) It sounds like you haven’t seen the product either, though, so blanket statements that it is 100% unsafe and could cause shaken baby syndrome are unhelpful and unproven. I’m willing to bet that the officials who work for CPSC.gov would never recall a product after just seeing a couple photos of it. LOL.